The classic phrase “design is in the details” is particularly relevant when you consider adding iron hardware such as a gorgeous iron door handle to your entry system. 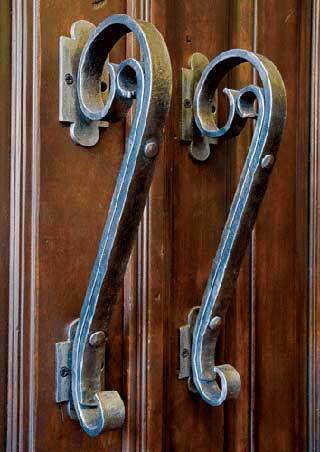 A beautiful iron door becomes even more stunning with a gorgeous pull handle. Custom iron hardware designs offered by Portella Iron Doors include handle systems to complete the entry system of any door, whether you add an iron pull handle to an old world door or a modern contemporary design. Our handle systems feature finely crafted and durable iron hardware, including a premium dead bolt and pull handle. Portella iron hardware utilizes an innovative roller-catch closure system which allows doors to open and close easily, with minimum effort. A range of artistic designs – from Mediterranean and European styles to sleek modern designs can be found on our website. Customers choose from a selection of finishes and patented deadbolt systems. The quality of Portella Iron Hardware and Doors is unmatched. As the only iron door manufacturer offering a rabetted one piece jamb with shaped kerf mold and one piece door stile/rails, Portella products feature a unique patented design. This specialized construction eliminates the use of multi-pieced together tube steel covered with bondo that is used by competitors. Portella’s patented design includes a fully integrated system of iron hardware to last a lifetime and a 10 Year Warranty. Click here to learn more about the specialized design that distinguishes Portella Iron Hardware. Iron hardware embellishes any entrance – whether you are enhancing an existing front door, remodeling your home and adding a new entrance or replacing the main entrance door. Contact Portella Iron Doors for detailed information on our exceptional products or visit one of our showrooms today.